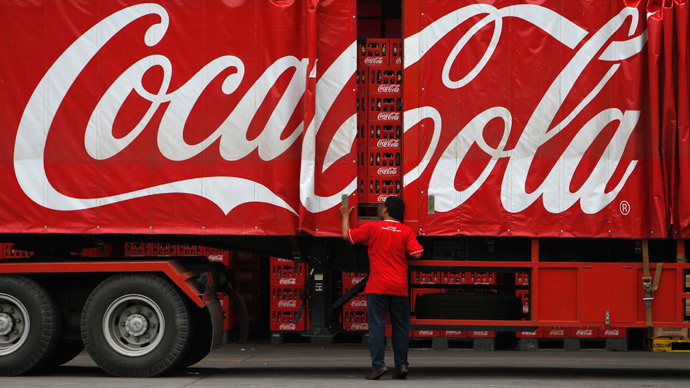 Coca-Cola Hellenic (HBC), the second biggest bottler of Coca-Cola products, has announced an 11.4 percent drop in fourth quarter profit, warning of further severe market decline in its biggest market Russia. “The market will decline, and we are working to hold the decline [in Russia and Ukraine] to mid-single digits,” Dimitris Lois, CEO of the Swiss-based bottler said, as quoted by the Financial Times. Sluggish demand coupled with political turmoil in Ukraine has killed sales in Russia. The Swiss-based company missed profit expectations largely due to the depreciating ruble, which lost more than 45 percent against the dollar in 2014. The company recorded a currency hit of more than $150 million for 2014, led by the weak ruble and euro. However, low oil prices make up for much of the currency loss. Overall, Lois said 2014 had been “difficult.” Last week, Coca-Cola HBC announced a $40 million loss in Russia in 2014. In March 2014, Coca Cola announced it was closing down a third of its juice production in Russia by shutting down two of its total four plants because of weak demand. One of the plants is in the Moscow region, and the other in Siberia. At the end of January, the world’s fourth largest brewer Carlsberg shut down 2 of its 10 breweries in Russia citing similar difficulties as Coca-Cola. Carlsberg entered the Russian market in 2008 and owns the country’s best-selling Baltika brand. Dutch beer maker Heineken saw sales fall by double digits in 2014 as beer became more expensive due to the economic slowdown as well as increased taxes on alcohol. The Russian market aside, Coca-Cola HBC is experiencing problems across the board, as weak demand continues to shrink the beverage giant. The company experienced weakness in the first nine months especially in Italy and Switzerland. Good news came from Greece, where sales were up two percent from the previous year, the first time in the last six years. However, the company may face more problems should Athens and Brussels not successfully re-negotiate the country’s debt package.